More than ever, Americans view their kitchen islands as the heart of their homes. So if your home doesn’t have one, you’re probably dreaming of adding a kitchen island. More than 70% of home buyers indicate they want one, and for 50% of those it’s a “must-have.” However, before you start knocking down walls and tearing out cabinets, you need to consider the unique opportunities and challenges you face. Yesteryear, hearths were the heart of a home. Yesteryear, home was a log cabin, and the hearth provided heat for the whole space as well serving as a cooking fire. These days, homes and kitchens are bigger than ever, but every home still needs a heart. Today, the kitchen island symbolizes that heart, and for very good reason. Whether you are searching for a new home or remodeling a kitchen, an island seems to be on everyone’s wish list. That’s because there’s a lot to love about an island. 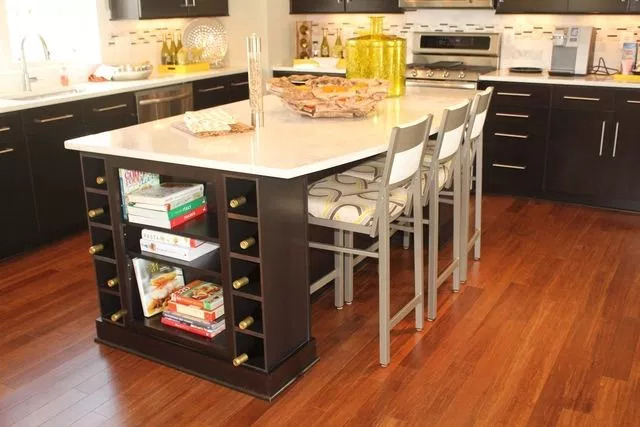 One reason we have fallen in love with kitchen islands is that they provide additional storage. As much as we love our islands, we love kitchen gadgets—from mixers, blenders, and espresso machines to slow cookers, juicers, and chocolate fountains. Where do you store it all? Islands offer storage behind closed doors or on open shelves right where you need it most. Another reason to add a kitchen island is the additional counter space. Nothing frustrates a cook more than lack of prep space. You need room to chop, mix, and assemble, and the baker in the family needs space to roll out the dough. What could be better than an uninterrupted slab of marble for making fudge? Perhaps your reason to love a kitchen island is the opportunity to add a second prep sink. Too many cooks don’t spoil the broth. They have more fun when there’s enough workspace for everyone! Perhaps you want to place the range where you overlook the family room instead of facing a wall. The days of banishing the cook to lonely exile in the kitchen is long gone. KP duty is no longer a punishment. An island outfitted with a range makes kitchen duty a pleasure! Let’s face it; the kitchen island is many a mom’s command central. When positioned strategically, it provides sight lines to the rest of the living space. You can keep an eye on the kids, whether they are playing, watching TV, or doing homework, all while keeping an eye on dinner. What is your island fantasy? It’s time to turn your dream into a practical reality. Your first step is to know what you need. What do you envision doing at your kitchen island? Your purpose will determine the type of island you need. If it’s a gathering space for informal meals, make sure the island’s large enough to accommodate the number of chairs you need. Will it be entertainment central? Outfit it with a wine fridge. Whatever your need or desire, there’s a kitchen island that’s perfect for you. The Kitchen Table. The easiest way to add a kitchen island is with a humble kitchen cart or table. The smaller scale and mobility is perfect for tight spaces. A table adds countertop space without the visual weight of an enclosed island. A cart, with locking castors, is there when you need it and disappears when you don’t. It’s DIY at its simplest. Storage and Dining. Islands provide great storage space for pots, pans, bakeware and kitchen appliances. The countertop provides all the prep space a cook needs. With an overhang, the prep surface does double-duty as dining space, whether toast and cereal in the morning or an after-school snack. Prepping & Washing. When there’s more than one cook in the kitchen, it’s helpful to add a second sink for washing vegetables and other food preparation needs. An island that needs plumbing also requires professional installation. Cooking. When the range is put center stage on an island, the cook can be part of the conversation, whether it’s catching up with your kids’ and spouse’s day or entertaining guests. This type of island is also best left to the professionals to install. Split-level. If you are cooking and dining, consider safety needs. Make sure you have sufficient distance between an open flame and your dining space; a raised counter height for dining is a great solution. For the pastry chef in your home, consider a section with a stepped-down height of 30 inches. Rolling out pastry dough or kneading bread requires downward pressure. Make your baker happy and provide the optimum height. Standard dining height is also 30 inches, so pull up a chair! Design is an art. This is the fun part of island dreaming. There truly is a kitchen island for every taste: farmhouse, traditional, transitional, mid-century modern, to industrial. You spend so much time in the kitchen you want it to inspire you! What type of countertop is best for your need? Granite, marble, and quartz are popular natural stones to select from. Concrete, butcher block and stainless steel all offer stylish benefits, depending on your need. Do you want your island to match your cabinets or offer a contrast? However, kitchen design is also a science. Counter height dictate seating height. Pendant lights or vents should be hung at a precise height above the counter. Clearance between the island and the perimeter cabinets depends on whether you have one cook or need clearance for two. Do you know what the proper clearance is for a wheelchair? One wrong measurement can be expensive to correct! Plumbing and electrical work absolutely needs to be done by a licensed professional who knows the local codes. A kitchen island with a sink, range, or wine cooler usually puts it beyond the skills of do-it-yourselfers. If it’s a matter of selecting a kitchen cart, you can handle the installation. Just be sure to take a measuring tape with you when you shop. For all other kitchen island installations, call in an expert. You don’t want to turn that island into the elephant in the room. Kitchen & Bath Unlimited has expertise in designing and installing kitchen islands. We’ll help you refine your ideas and desires into a practical and beautiful addition to your kitchen. We work within the constraints of your space, whether large or small, to design a perfectly proportioned island that works hard and looks great. Even a relatively simple kitchen island requires a myriad of decisions. Your sweet dream can quickly turn into a nightmare as you shift from design to installation. Trust us with the technical details so your installation will go smoothly. Kitchen & Bath Unlimited has over 30 years of experience with kitchen installations. We’ll pay as close attention to detail as you do. We won’t be satisfied with your kitchen island until you are. Come browse our showroom for ideas. Check out the latest trends. Share your island dream with us. We want you to quit dreaming and start living your kitchen island dream!